Thank you to all students that have worked hard to make a proposal and those who have at least have some interest in our project. From now mentors will study the proposals and if needed will contact students. On may 6th Google will announce the winners of the so called GSoC "interns".
. DESCRIPTION OF THE APPLICATION TO BE DEVELOPED , NOTICING THE TECHNOLOGIES TO BE USED AND HOW YOU'LL USE THEM. Next to a proposed development calendar. - Didn't taken a look at our videos or projects as we need you are prepared for real for the proposal you're sending us. You're presenting to Liquid Galaxy and you need to be aware of what's our platform and how it works. Some students think than with developing an Android app the proposal will be ok, and this is not correct. You need to explain us that how your app, web based or android/flutter based, will connect to a Liquid Galaxy and what kind of visualization will appear. This is the most important thing to showcase, the app is the backend, plus all other needed code and databases, the visualization is the result. The GSoC platform is now open for proposal presentations !!! in his university and the proposals. Initially those can be on draft mode, but have to be final before april 9!! So students upload your proposals and from now the GSoC platform is the place to review your projects and interact with mentors through comments till you finally convert it to final PDF. The Liquid Galaxy project is based on a cluster of computers and displays, minimum 3. Noted than in most cases you'll need your own galaxy rig, as we call our clusters, usually based on 3 pcs and 3 screens, and a separate server in the same LAN that will run the needed and developed applications. In the Liquid Galaxy for Education (LGxEDU) the student will need a set of Chromebooks laptops or PCs running a VM with Chrome OS. As the date to start sending proposal to the main GSoC site is approaching, we’re asking all really interested students to send us their proposals upon the base format proposal doc available to help them in make a great and complete one. Finally we have decided that some originally proposed projects arfe not enough work charge for 3 months and have merged in one, please double check and modify your proposals accordingly. Around 40 students have already contacted our organization. We've sending emails to all of you with different comments and opportunities. Finally you all should have got an email with latest steps for the presentation of your chosen proposals, please check your inboxes, and if not received send us an email. Interested GSoC students, those ideas have been crafted by the worldwide Liquid Galaxy (LG) community and mentors team thinking in some tools we need for the LG system and some projects we believe will be not only a nice showcase of the platform, but also a new era for the worldwide project adoption. As sample, we believe the Liquid Galaxy for Education project will be be used in lots of schools, as it will be a free system running over already owned Chromebooks. For your reference too, you can take a look at our page of old GSoC project internships. 1: Start browsing this web site https://www.liquidgalaxy.eu to see what's the Liquid Galaxy about, the things the system does and the different applications it's used for. Please take note of your findings as you will have to explain them. 2: Browse this Ideas Page and think if you want to apply for any of those projects. Also we're always willing to listen for new ideas for our project !!! 3: Initial communications will be only made asynchronously by email, so when you have an idea connect with us by email at liquidgalaxylab at gmail dot com. 3.1: What's the reason you want to apply to us, develop this deeply. 3.2: What do you see of interest in our platform. 3.3: What's the project you want to develop for. Write about what's the link with your personal interests, programming abilities, technologies and so on. After mail review a the admin and mentors team will contact you ASAP, starting the conversation. 4: At some point the mentor may inquiry you to have a hangouts for live interview. 5: Later you can be asked for some proof of coding knowledge, like develop some code snippets to test your abilities for the project. 6: Record a 2 minutes video of yourself explaining the reason we have to choose you, covering both personal and technical aspects of your proposal. 7: Finally a copy of our standard project proposal will be forwarded to you to fill up. Your final proposal will be the one to upload to the GSoC platform, and will include the description of the project, the technologies to be used and the estimated code deliveries by dates. You will have always a mentor guiding you in the process. Please contact us at liquidgalaxylab at gmail dot com with any question and follow GSoC portal rules and instructions to apply to the program. Good luck! Slack note: Our Slack channel will be open for the announced by Google selected 2019 GSoC students on the first week of may. Not published in special order, just choose whatever you want and start writing a proposal ! GSoc 2015 student Rafael Durán developed the first version of our widely used Android app for controlling the LG. Iván Josa refurbished it on GSoC 2017 publishing it on the Play Store and our Github. Also a dozen young students from Google Code-in 2018 contest developed simple applications with Flutter. Flash forward to 2019 Android still reigns the mobile development with 80% of the market, but new technologies are evolving. Among those we've watching closely the aforementioned Flutter, an open source cross development platform. 1: Have a modern UI based on Material Design. 2: Being developed with Flutter. 3: Incorporating the OSC protocol to communicate with the Liquid Galaxy, instead of the actual SSH. 4: Incorporating finger gesture navigation. To avoid users to acquire expensive hardware, implement the function of navigating the LG through finger movements on the screen. This code has already been developed in our Alpha version of the LGxEDU application. All of this with a previous user interface analysis to improve actual navigation and functionalities. - The new App published on the Play Store under the Liquid Galaxy LAB account. - Full documentation and code on our Github. The panoramic maps view of the LG is able to serve as an amazing dashboard with rich visualizations on geo locations. While we have develop on the years different ways of importing data from external sources for every project, we never had an approach to make it in a standardized way. - A library that will run on our separated local server running Linux (not the master PC) that will allow the simulation, acquisition, storage, statistical analysis and visualization on the LG of external data. - A demo case will have to be developed, one based on multiple LoRa sensor networks. As it's difficult to get access to this kind of sensor data from public APIs, a script will be also develop to simulate a network of sensors, with the standard protocol and with continuous generation of data. Minimum data to have is 6 sensors, like wind direction and speed, humidity, temperature, solar radiation and pluviometry. - A documented research of the LoRa protocol is required too, with the definition of the data packets used in transmission and sensor data. At schools teachers teach children geography and history using traditional methods such as paper maps. In order to improve the learning method we need an intelligent system capable to interact with children being intuitive, adapted to the final user, with good performance, and having useful information and resources. - A navigation tool using the tablet screen with two finger gestures. This will allow schools save money not buying an expensive Space Navigator, but using an already owned Android tablet. - A game engine, where on one side teachers can create and share contents, and students can play in groups of 5 at the classroom. The quizzes of the game engine have to be simple and fully geolocated, with both geography and history contents in mind. - The installation process will be a recreation of the typical LG install on Chromebooks laptops. EXTENDED DOCUMENTATION available for interested students, just send us mail asking for. 1: A fully documented installation variation of the Liquid Galaxy core system installed on Chromebooks using Crostini. 2: An Android application that can connect to a Chromebooks based LG or a regular PC Linux based LG. The app has to include a minimum 5 different kind of new games, with 5 samples quizzes for each kind of game. The quizzes share functionality has to be develop using Google Drive API. We want to have a system that handles personal data for representing in the Liquid Galaxy. Usually we represent regular data, but for this project we want personal data (that will be anonymously generated) to be shown on the LG. This project has been rewritten, as noted in top of the Ideas Page. The project will deliver three different libraries working over a use case, as sample to show up the developed code. - All the mentioned in their projects below. - A demo use case will have to be developed, and will be the Google Project Wing simulator . Google Assistant (GA) is becoming the main platform in the field of natural voice interactions and Artificial Intelligence. While the Liquid Galaxy (LG) supports voice commands since the beginning of the project, Google Assistant and the technology behind will allow LG users a richer voice interactivity. - A library for the integration of the GA in the various LG main user interfaces, like the web or Android applications. The library will have methods to achieve a complete LG navigation, and also be ready to answer complex queries like "What is the world's highest mountain?". The Google Assistant queries will be issued through a local Google Home, mini, AIY voice kit or Hub. - A demo case will have to be developed, integrating the library on the use case with the examples to be developed by the student. - A documented research in the different ways of interaction with the LG platform, as the library has to cover the main user commands, usually through the Android app, like sending and search the LG to a location, launch of tours and other applications, but also richer possibilities like querying 3rd party APIs like Wikimedia for obtaining results displayed in a location of the LG in queries like: "What's the largest mountain in the world ?" that will result in "Mount Everest" and a posterior query to Google Maps API to get the coordinates. When you think with the Liquid Galaxy project, you could think the way other devices interact with it via Wi-Fi or wired. You may well think there is an API managing all the connections but not, that is not the way, at the moment Liquid Galaxy communication is done using the SSH protocol to send and receive information. The idea of this project is to implement an API using the programming language that you prefer, for example Node.js. This API should be able to receive, at least at early steps, commands to move the camera over the Earth. Once the basic functionality is done the API will have to do more complex commands like read a KML file and move the camera over the differents points. With this API we will be able to remove all the SSH connections that Android applications are using. Hence it will give the possibility to developers think on new projects for the Liquid Galaxy faster, as the communication between the devices will be easier to implement, its are HTTP requests. - A simple demo launching POIs to the LG from the use case. While we have develop on the years different visualizations with overlays on the LG, usually from composed KMLs with importing data from external sources, we never had an approach to make it in a standardized way. - Lines, shapes (triangles, squares/rectangles, circles, and his cylindrical versions). - Single points with metadata to be shown in balloons (or bubbles) containing text, images, sounds, web sites and Youtube videos. - Photo or image to be overlayed geolocated in to the LG. - The library with a minimum of ten different contents handled. - A demo case within the use case. The panoramic display of the LG has been used in the past to shown up and even control fleets of drones with amazing results. Now we want to develop a Google's own Project Wing simulator. This project is mainly focused in this moment in the delivery of food or other small shopping packets to private houses. The application to be develop will handle from the simulation of the flight data, including paths, kind of packets, timing, etc, to be visualized on the LG. - A program that will allow enter or the automatic generation and storage of historical data of flights. - An extension of the library that will create the KML and other components needed for the LG visualization. For use in our open projects we need to develop a complete library that handles the analysis and the visualization of photographic data on the Liquid Galaxy. - A library to import and analyze forest photographs from local files. The analysis will be based on Tensorflow technologies. - Creation of paths around forests upon to be determined parameters. 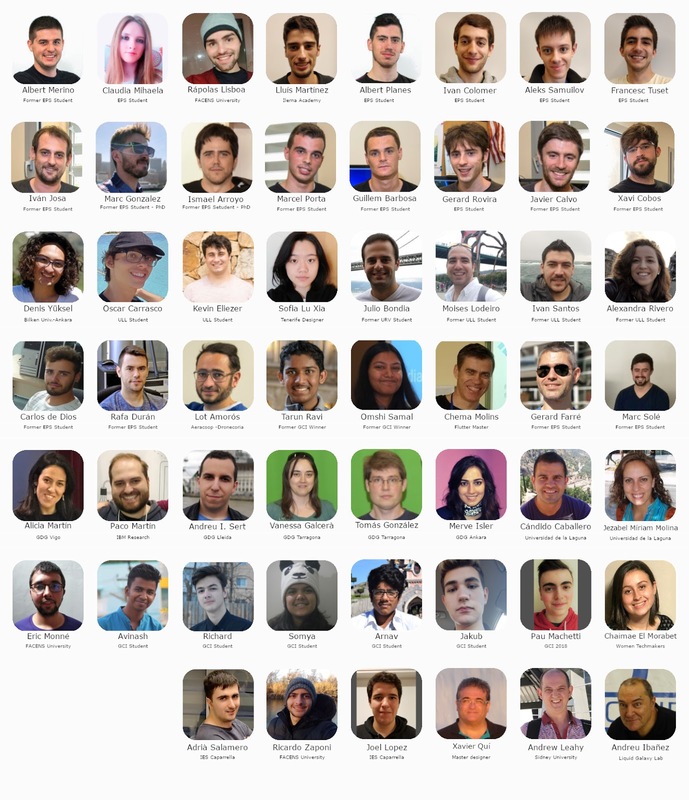 Lots of our students and our large mentors team, belong to different technical communities, such as Google Developer Groups global network, JAVA, Flutter, Cloud, and dozens more. We always wanted to have a tool for events that will showcase those communities and their activities around the world. Now with lots of them being active in the Meetup.com platform, we have the opportunity due to his API. - Data capture of one or many different communities data available through the Meetup API, storing it in a local database. .
- Presents the data on the Liquid Galaxy including at least, name of the group, location, latest activities, photo members, statistics. - Social activity visualization, tweets and hashtags, photos on different platforms. - Timeline visualization, tour with events of a community in a period or time. - Minimum two communities represented in the App as demo: GDG, and a chosen one by the student.